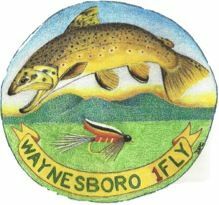 The Waynesboro One-Fly, sponsored by the Shenandoah Valley chapter of Trout Unlimited, Waynesboro Tourism and the South River Fly Shop, is set to be held April 26, 2014. Teams of two anglers will compete with the one fly of their choosing, with all proceeds going to education and conservation programs of Shenandoah Valley Trout Unlimited. Waynesboro, VA, April 26, 2014: The Waynesboro One-Fly is a fly fishing tournament for teams of 2 anglers. Each contestant competes using a single fly that follows tournament guidelines. Participants will fish a 3 hour session on an assigned beat with one fly of their choosing. There will be an optional fly change at 1 1/2 hours into each session. Registration for the tournament includes premiums with our logo and a ticket to our event dinner, hosted by Heritage on Main. The winning team will receive a prize-package worth over $1000. Tournament participants may register by mail or call Tommy Lawhorne at 540-649-1915. Registration forms are available in many local and regional fly shops, or anglers can send name, telephone # and email along with $200 / individual or $400/ team to the South River Fly Shop. Single registrants will be paired with a partner angler, if possible. Spectators may watch the tournament action for free and enjoy strolling along the Waynesboro Greenway Trail. They may also attend the event dinner for $25/ person and bid on silent auction items. Sponsorships, at levels ranging from $50 and up, are available to businesses and individuals who would like to support the One Fly. Sponsors will be featured at the event and in our advertising. Trophy Stocking: In conjunction with the event we have added hundreds of additional 14”-20” rainbow trout to VDGIF stockings of the South River Delayed Harvest area. These trout, funded by angler donations and another grant from Waynesboro Tourism, promise to make Waynesboro a preeminent regional destination for fly fishing. Funds raised from entry fees, sponsorships, dinner tickets and items auctioned at the event dinner will be used for additional stocking of the South River, Trout in the Classroom and habitat improvement on the South River. Organizers: The Waynesboro One Fly is organized by Shenandoah Valley Trout Unlimited and the South River Fly Shop. The event was made possible by a grant from Waynesboro Office of Tourism. More information, including tournament rules, can be found at http://www.flyfishwaynesboro.com.